In June 2003, General Eric Ken Shinseki in his farewell speech at his retirement ceremony, a departure forced upon him by the current US administration, warned against arrogance in leadership. The comment he made then was very firm, and should come back to our minds, the day Barack Obama discloses his intention to appoint this four-star general as Secretary of the Veterans Department. Gen. Shinseki is a very good choice. Once again President-elect Obama has shown he means business. Children keep smiling and welcoming a better world. They believe in the future, they also ask for so little. Protection, schools, acceptance of their diplomas once back in Darfur, and no forced recruitment into any armed group. There is always a way forward. One should open the windows that are available and move on. 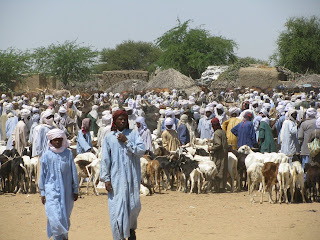 Every Sunday, people from many places, including from Nigeria and Niger, come to Karmé, 165 Kms East of N´Djaména, to sell and buy livestock. It is time for big business. 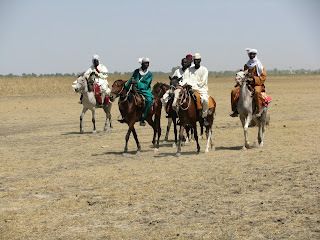 Money flows all over and people enjoy the tranquility of a day with different communities. 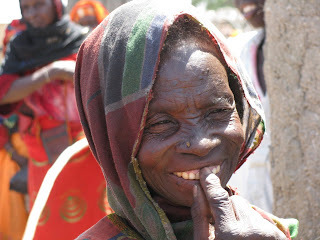 It is not very easy to play a social role, if you are a woman in the Sahel. But the market place is opening new opportunities for women to earn a living and have a voice. All they need is a good rainy season, water, water, water. And security. Then, they take care of their families and themselves. They are not heavy on world resources. 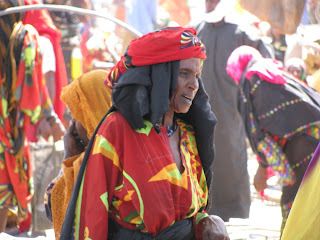 The market place, even in the middle of the Sahel, in very harsh living conditions, is a crossroads of hope and freedom. It is wise not to expect much and keep the smile on.
" Self-control is the basis of all industrious virtues. "